Black Star is Avril Lavigne’s first fragrance (well, one that’s named after her anyway) and it’s just about as unremarkable as I thought it would be. Though my initial hope for it, upon seeing the bottle was that it would be something more interesting. 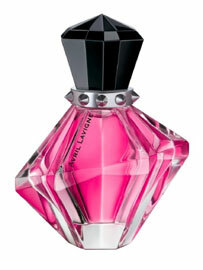 In Bottle: Smelling citrus and juicy fruity notes. Blackcurrant, I’m thinking, with plum and something smooth, sweet and flowery. Maybe honeysuckle. Applied: Plum and citrus up front with the citrus receding very quickly. Something in this smells of apple for about ten seconds. It’s a very recognizable and familiar apple note that I swear I’ve smelled before. But it was a very fleeting note. The rest of Black Star evolves into a nice, full fruity vanilla fragrance. Highly agreeable but very reminiscent of Love Etc. by The Body Shop. The difference between Black Star and Love Etc. is the underlying notes. Love Etc. was more tart. Black Star has this very sweet, smooth vanilla-like note warming up the fragrance and cutting the tartness. Black Star dries down to a nice, soft fruity scent. Extra: One of the things you start to realize as you get more and more into fragrances is that the press releases are often full of flowery language that doesn’t mean anything. Black Star for instance is supposed to be unique and individual much like Avril Lavigne tries to be (on the outside anyway). But there’s nothing really new going on with this fragrance at all. Design: The bottle is a bit silly looking to me, but I’m not the target audience for it. It’s contained in an interestingly shaped glass bottle with a plastic top that has spikes running the rim of the cap. You can take the spikes off and wear it was a ring. An uncomfortable ring. The sprayer I tried was fantastic. One of the nicest, most even distribution I’ve ever seen. I know the sprayers on every bottle tends to differ a little and I probably sound like a lunatic for raving over a sprayer nozzle but that’s just how I roll. Notes: Plum, apple, lemon, hibiscus, honeysuckle, dark chocolate, vanilla. The PR for this fragrance was pretty sparse with the notes, only disclosing three things. Hibiscus, plum, and dark chocolate. There’s obviously more at work in this than they’re letting on so I slapped some of what I think I’m smelling up there. By no means go with my list and honestly, who cares, form your own notes list. Be a rebel. Anyway, despite the advertising campaign insisting this is an edgy fragrance, it’s really not. It’s about as tame as it can get. You say edgy and I think of the nasal assault that is Secretions Magnifique, not Black Star. Black Star is just a very pretty, girly, young, fruity fragrance that bears a pretty striking resemblance to Love Etc. Reviewed in This Post: Black Star, 2010, Eau de Parfum. This entry was posted in fruity, Reviews By House, spin off, sweet and tagged avril, black, body, chocolate, etc, fragrance, fruits, fruity, lavigne, love, perfume, review, scent, shop, star, vanilla. Bookmark the permalink.